Our engineering department has formulated a very effective asphalt blacktop sealer. Every experienced black top man will tell you that any blacktop area is just like the wood trim on a house. It needs a sealer to protect against deterioration, sun, ozone, ultraviolet, water, etc. 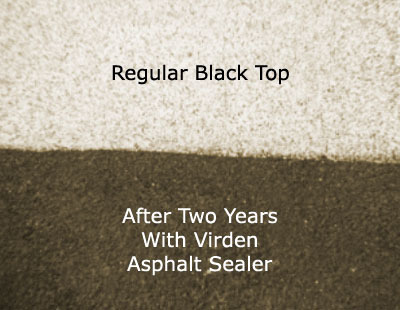 Virden’s blacktop sealer does just this! Greatly reduces cracking and movement as it adds to the elasticity of the blacktop material, for up to two years. Accompanying photo shows before and after results. No special equipment or personnel required. A squeegee or large mop brush is all that is needed. Dries completely and ready for traffic in five hours. Will not stay gooey and track in on auto or office carpet. The ideal combination is filling cracks first with Virden Crack Filler and then applying Virden’s Black Top Sealer. Call 806-352-2761 for more information about our advanced blacktop sealant!